Early in the 1989 season, the Greensboro Hornets took on the Gastonia Rangers, Greensboro coming out with a 6-0 win. Not only did Gastonia get shut out, but the single-A Rangers also got no-hit. One of three Greensboro hurlers on the mound that day in the combined no-hitter was Mike Malley. Malley was starting his second season as a pro that year for Greensboro. He ended up getting 39 outings, with seven starts. His career, though, lasted just two more seasons, Malley never making AA. Malley's career began in 1988, taken by the Reds in the 36th round of the draft, out of the University of Connecticut. With the Reds, Malley started in the rookie Gulf Coast League. He went 3-2, with a 3.22 ERA over 11 outings, two starts. 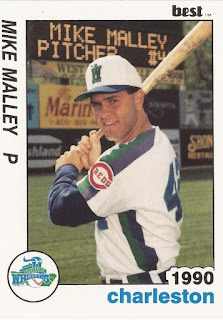 Malley moved to single-A Greensboro for 1989. In 39 outings, seven starts there, Malley went 8-4, with a 3.61 ERA. For 1990, Malley moved to single-A Charleston, but it was a short season. He got just seven outings, three starts, ending with an ERA of 2.74. In an April game, Malley went five innings, giving up a single hit. That hit, though, was costly, a three-run home run. That December, Malley was taken by the Indians in the minor league draft. With the Indians, Malley got into 15 games, seven starts between short-season Watertown and high-A Kinston. He had a 1.50 ERA in six starts at Watertown, but a 10.19 ERA in nine outings at Kinston. It was his final season as a pro.